If you like to overload your brain with information like I do, you are going to love this article! This BBC's Storyville documentary follows the history of the Anonymous hacker group through interviews with members, writers, and technologists. It is an unreleased American documentary film directed and written by Sam Bozzo. The film follows the hacking adventures of famous notorious ex-hacker Adrian Lamo. This film is narrated by Kevin Spacey. This film contains interviews, parties and presentations -- celebrating DEFCON's 20th year (actually celebrated in 2012). This documentary film is directed by Vivien Lesnik Weisma. It is all about the targeting of hacktivists and journalists by the US government. It is a 2008 documentary film directed by Ashley Schwartau. The film is a portrait of the hacking community. This film takes the viewers inside the complex culture and history of the Anonymous hacker group. The film is all about a Romanian town nicknamed "Hackerville". This film focuses on the Sweden-based file-sharing site The Pirate Bay. It is a 2001 documentary film directed by Emmanuel Goldstein under the banner of 2600 Films. This documentary tells the story of Kevin Mitnick through the interviews with relatives, friends, lawyers, and experts in the computer and civil liberties arena. In The Realm of the Hackers is a 2003 Australian documentary directed by Kevin Anderson. This film tells the story of two hackers named "Electron" and "Phoenix", who were members of an elite computer hacking group called The Realm and hacked into some of the most secure computer networks in the world, including the US Naval Research Laboratory, Lawrence Livermore National Laboratory and NASA. A Gift for the Hackers is a documentary film that focuses on the lack of internet security. The film starts off with a question: "Increasingly devices like printers and scanners are being connected directly to the Internet. It's all very convenient, but is it safe?" This film explores the hacker community and computer security through various incidents. This film reveals the daily battle between the Internet’s outlaws and the hackers who oppose them by warding off system attacks, training IT professionals and police officers, and watching cyberspace for signs of imminent infowar. This film takes a deep look into the ever-growing problem of cyber attacks in both the civilian and government sectors. Web Warriors is a documentary film from CBC. The film features computer hacker Michael Calce aka Mafia Boy, who shutdown Yahoo, Amazon, CNN, and Dell from his bedroom at the age of 15. 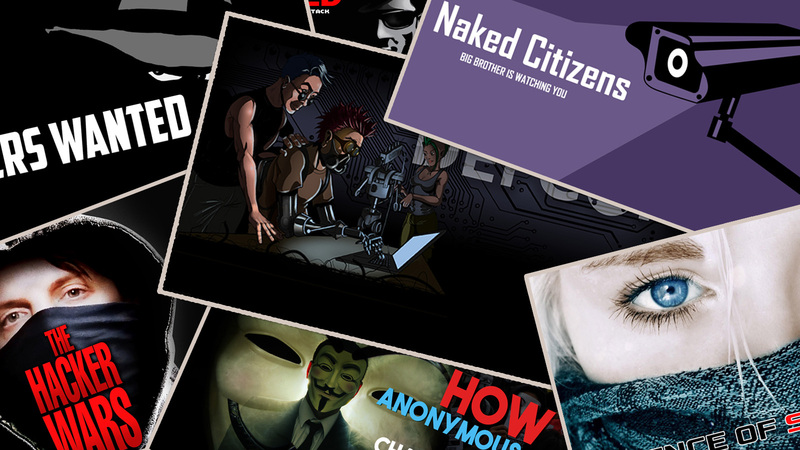 The 16x9 takes viewers into a "Hackers World" through interviews and news reports. It features the infamous hacker collective "Anonymous"--A decentralized hacker group working against the corruption and internet censorship. Dispatches (British TV series) examines allegations that during Andy Coulson's time as editor of News of the World, phone hacking was a routine practice at the paper and carried out with his knowledge. This film talks about the US cyber security and state-sponsored hacking attacks. This film talks about piracy, surveillance and internet freedom. Inside the Dark Web is a documentary film from BBC. The film is all about the internet surveillance. This film talks about privacy and national security. America's Surveillance State is a documentary series from PressTV. The film talks about the mass surveillance condition. United states of America has become the United states of surveillance! Spying on the Home Front is a documentary film from PBS. The film talks about NSA's massive spying program and warrantless wiretapping. Naked Citizens is a documentary film that shows how online and CCTV surveillance data is being used to arrest "terror suspects". Can Hackers Be Heroes is a short documentary film from PBS Digital Studio. Looking beyond the media hype and scare tactics, it is clear that "hacking" is a term whose meaning should be up for debate, and that some hackers could in fact be heroes and not just villains. The Bitcoin Gospel is a documentary film that talks about the power of Bitcoin in today's world. When the financial world collapsed in 2008, a mysterious genius under the pseudonym Satoshi Nakamoto presented the architecture for the perfect, bankless currency. Bitcoins can’t be forged, and can be transferred worldwide with one click of a button, without transaction costs. The Science of Surveillance is a documentary film that takes viewers into the disturbing world of surveillance technology and scans the latest and future technologies used to even spy on the private lives of citizens. This film talks about the cyber bullying and the importance of staying safe online. In just 10 years, Mark Zuckerberg has gone from his Harvard college dorm to running a business with 1.19 billion users, and a possible value of $200 billion. Inside The Mind of Google is a documentary film that tells the story of the biggest search engine "Google". This is a fascinating story of how two grad students, in barely a decade, took a one-time research project and turned it into a global technology powerhouse -- changing the way we interact with information, the Internet, and each other. The Virtual Revolution is a documentary film that talks about the World Wide Web through the interviews of technology experts. The Internet’s Own Boy follows the story of programming prodigy and information activist Aaron Swartz. From Swartz's help in the development of the basic internet protocol RSS to his co-founding of Reddit, his fingerprints are all over the internet. But it was Swartz's groundbreaking work in social justice and political organizing combined with his aggressive approach to information access that ensnared him in a two-year legal nightmare. It was a battle that ended with the taking of his own life at the age of 26. Aaron's story touched a nerve with people far beyond the online communities in which he was a celebrity. This film is a personal story about what we lose when we are tone deaf about technology and its relationship to our civil liberties. This is a well made documentary about the origins of Wikileaks and the steps they take to release info to the masses.